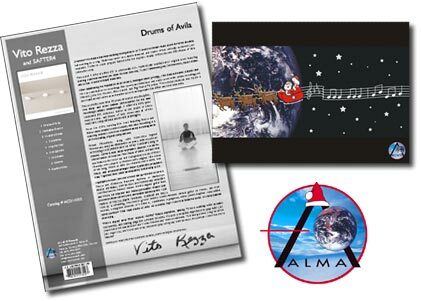 Alma Records is a Toronto-based record label that produces high-quality jazz, pop and world music albums. They approached us with the need to develop an enhanced CD for their latest jazz release, One Take Volume 1, which was a 2004 Juno nominee. The album's cover art had already been designed, so we created an interface that complemented the existing art. We added elegant animation and interface cues that flowed with the album's music. 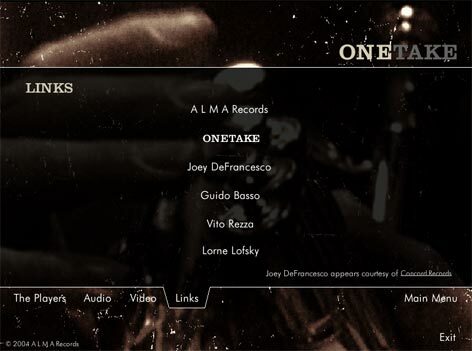 Quicktime video elements and artist bios consisting of still images and text were also integrated seamlessly into the project. The end result was an enhanced CD with highly intuitive navigation and great visual effects. The CD is currently being distributed by Universal Music Canada. “Kenneth Young Design thoroughly understood all aspects of multimedia development, from design to programming to deployment. They took our raw video, audio and image files, and integrated them seamlessly into a polished multimedia package. They were very easy to talk to, and when important decisions needed to be made, they could always explain which course of action was most appropriate for the given application." We also helped produce their promotional DVD, which contains music videos by the various artists under their label. The DVD featured an animated introduction and static menu, from which the user could select and play the desired video with their DVD remote. To get us working on your next multimedia project, contact us for a free quote . There are enough video file formats in on the market today to make one's head spin. Certain file formats are designed for the web, others are better suited for distribution on CD, and still others are best for DVD. To make matters worse, most formats have a huge number of confusing options, the changing of which can have a dramatic impact on the size, quality, and compatibility of the resulting video. Knowing which format and options to use for a specific application is not a trivial task, and it's one that we take very seriously. No matter what the requirements, we always ensure that the final video meets the standards of compatibility, size and quality set out at the beginning of the project. If you have a project involving video you want done right, please don't hesitate to contact us.